Donald Trump's star on the Hollywood Walk of Fame is seen after vandals targeted it on Tuesday, Oct. 25, 2016. 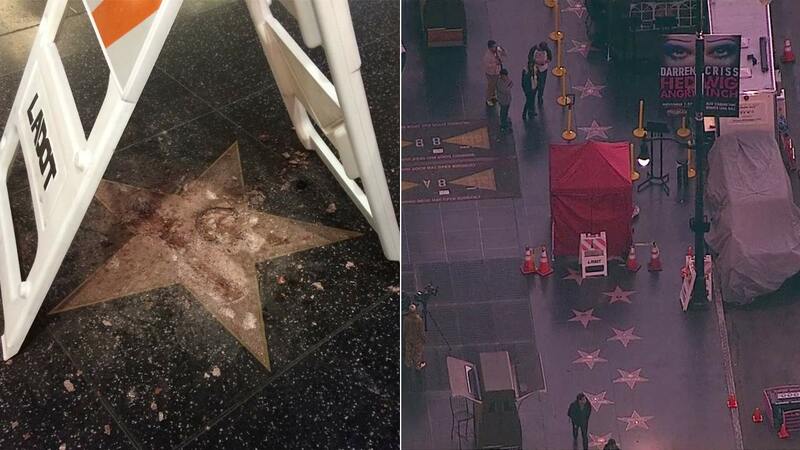 HOLLYWOOD, LOS ANGELES -- A suspect has been arrested in connection with the vandalism of Donald Trump's star on the Hollywood Walk of Fame, the Los Angeles Police Department announced Thursday morning. The LAPD did not immediately disclose the suspect's identity, but said the person was arrested without incident and was being booked at the Men's Central Jail in downtown. The charge was not specified. In an interview at the scene Wednesday morning, a man who identified himself as James Otis said his motive for destroying the star involved the sexual-assault allegations against Trump. Exclusive video from Deadline.com shows a vandal smashing Donald Trump's star on the Hollywood Walk of Fame. "I have four or five family members (who were) sexually assaulted," Otis said. "I'm terribly upset that we have a presidential nominee who's become the poster child for sexual violence." He told a camera crew that he planned to sell pieces of the star and donate the proceeds to women allegedly sexually assaulted by the Republican candidate. The LAPD on Tuesday received a report that someone was threatening to vandalize the star on Hollywood Boulevard. When officers arrived at the location, the damage had been done and the vandal was gone. The demolishment -- committed by a man wearing a construction hat and vest -- was done with a sledgehammer and pickax, and captured in an exclusive video from Deadline Hollywood. The man who smashed Donald Trump's star on the Hollywood Walk of Fame said it was a protest of the sexual assault allegations against the GOP nominee. According to several witnesses, the incident began at about 6 a.m. and did not initially seem unusual. "Because he had on a vest, a construction vest, he had on a construction hat, he had the dividers, so I just thought he worked for the city," Gregory Howie, a street artist, said of the vandal. "The Hollywood Walk of Fame is an institution celebrating the positive contributions of the inductees. When people are unhappy with one of our honorees, we would hope that they would project their anger in more positive ways than to vandalize a California State landmark. Our democracy is based on respect for the law. People can make a difference by voting and not destroying public property." Repair work on the star was underway by Wednesday afternoon. Gubler said the brass lettering had been reinstalled, and that the terrazzo would take several days to several days to season. "Once we deem it's ready, they'll come back and polish the star," Gubler said. "It will look as good as new."